Rose Mibab knew Carl Goldberg as a family friend who owned the business next door to her own family's business in Wladimir-Wolynsk, Poland. Both lived happily with their families, Rose with her parents and siblings, Carl with his wife and daughter, Nechama. Rose, twelve years younger than Carl, often played with Nechama. The German invasion of Poland in September 1939 changed everything. Carl's wife and daughter died when their house was bombed. By the terms of the Hitler-Stalin pact, the Germans withdrew from the area and ceded control to the Soviets, but they returned with a fury in 1941, unleashing total war against their former Soviet ally. Immediately, the Jews of Wladimir-Wolynsk were forced into a ghetto that happened to encompass the Mibab and Goldberg businesses, which were used as living quarters by scores of ghetto inmates. Rose and Carl took comfort in each other as they tried to save themselves and their surviving loved ones. Escaping the ghetto, Rose ushered family members from hiding place to hiding place, while Carl fought with partisans against the Germans. In late 1944 they reunited in Russia. They returned to their hometown in Poland and married shortly thereafter, but the absence of their families meant it no longer felt like home. After spending time in a displaced persons camp in Germany, Rose and Carl immigrated to the United States in 1949 with their own three-year-old daughter, Eva. Their ordeal didn't end with the war. 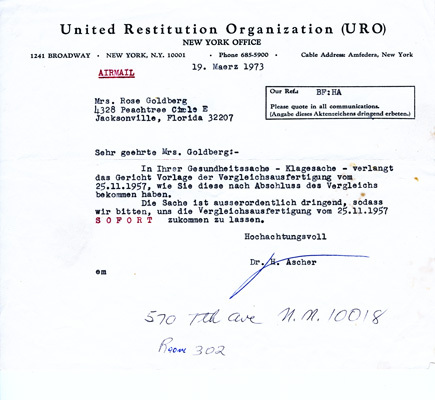 Rose and Carl spent the next half century trying to get German authorities to recognize their suffering and make restitution. Their personal papers, some of which are included here, detail this largely futile and hugely frustrating effort. 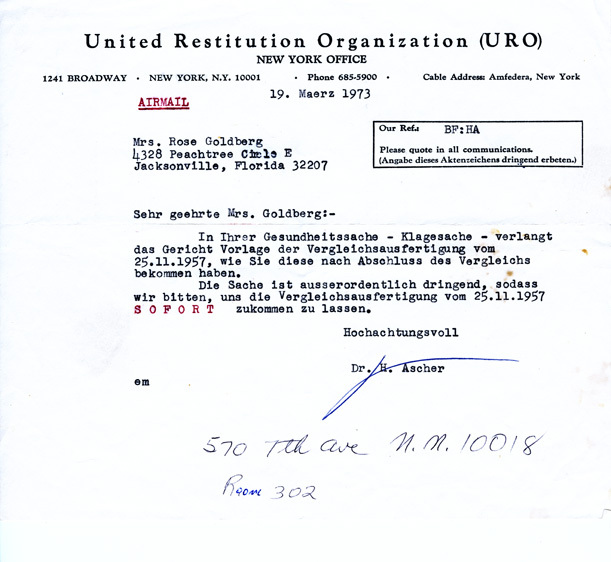 This note from Dr. Ascher of the United Restitution Organization (URO), sent by airmail and dated March 19, 1973, urges Rose to send the official copy of her settlement from November 25, 1957 to the URO "IMMEDIATELY," because the court demands it regarding her health case.